There are so many dresses and so many styles. You might start to feel overwhelmed seeing all those gowns because you don’t know where to start. Don’t worry; most brides feel this way, which is why dress shopping, while the most exciting and emotional part of the preparation, is also the most dreaded task on the checklist. Before you start your search, one thing to understand is that we all come in different sizes and shapes so what looks good on your best friend might not be the best style for you. Knowing what kind of silhouettes are most flattering for your body type will make this process a lot easier. A good rule of thumb is to accentuate your favorite body part whether it’s your beautiful décolleté, small waist or your womanly curves. Also, keep in mind: this source is an excellent guideline, but it’s just that—go with the dress that you love and feel most confident and beautiful in! 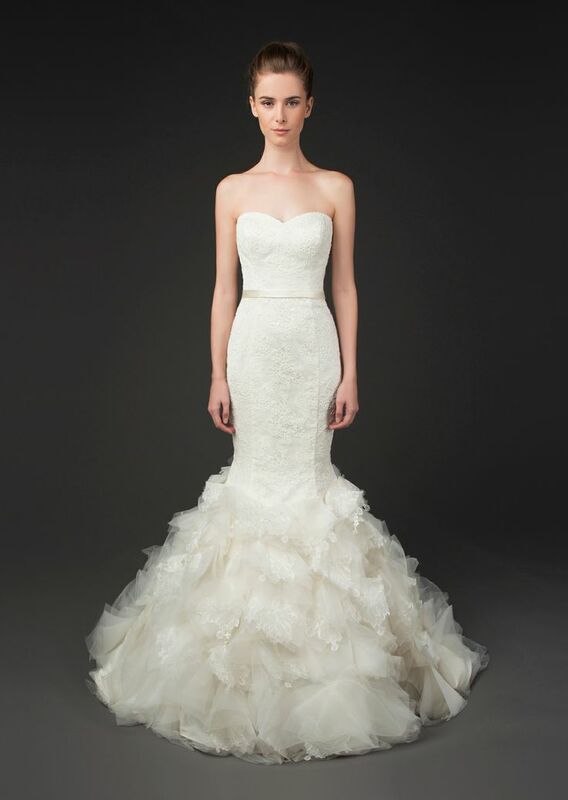 After all, you will be the one walking down the aisle in this dress. Ball gown: princess style that poofs out from waist down. Perfect for:Pear/Circle body type – this style hides the stomach and hips, while accentuating neckline. 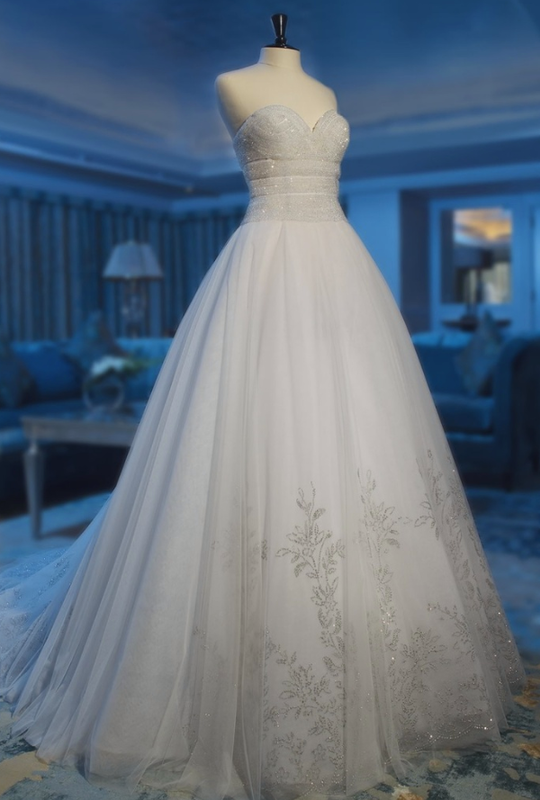 A-line: similar to ball gown but skirt is more flared than poofy. 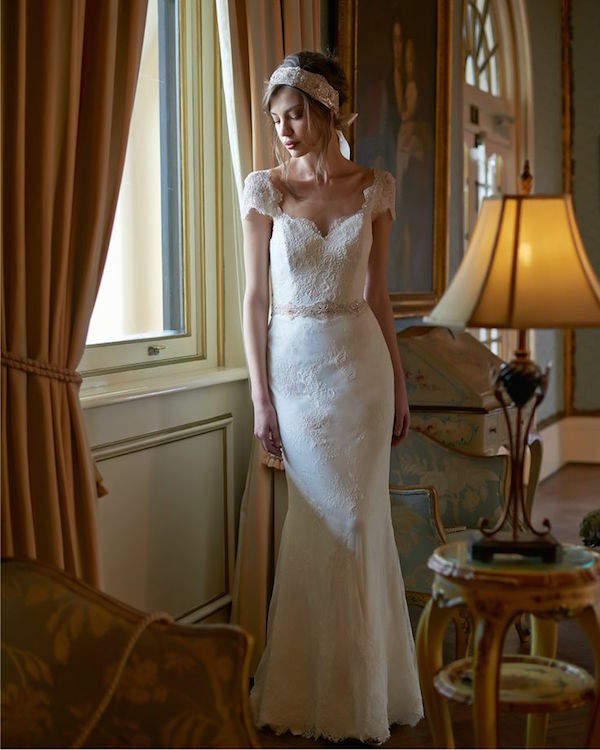 Perfect for:Straight/Pear/Hourglass/Circle/Inverted Triangle body type – this style is flattering on most brides. Sheath: skims the body and falls straight down to the ground. 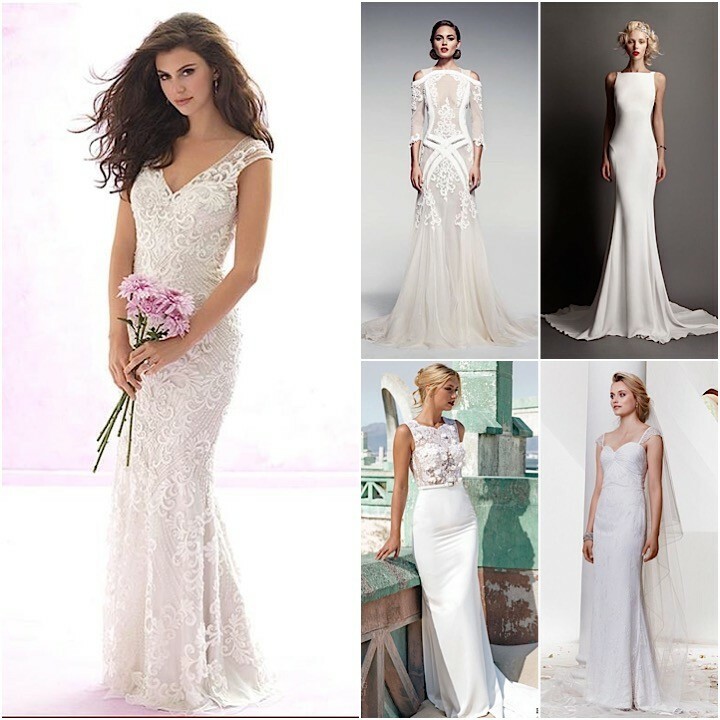 Perfect for:Straight – this style is best on slim and tall brides. Trumpet: hugs the body and flares out above the knee, creating a trumpet silhouette. Perfect for: Straight/Hourglass/Inverted Triangle – this style will hug the body and accentuate the hips. Mermaid: hugs the body and flares out below the knee, creating a mermaid silhouette. 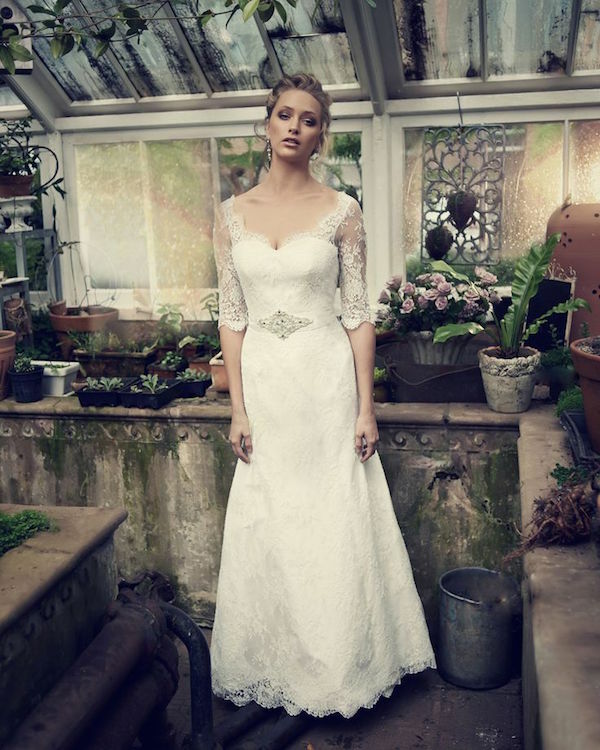 Perfect for: Hourglass – this style will flatter the curvy brides features. Empire waist: high waisted; waist line sits right below bust. Perfect for:Circle/Pear/Petite – this style will elongate the body and draw the attention up. With these tips, I hope you will use it as a reference while shopping for your perfect dress but remember that it is only a guideline. Some additional tips that’ll enhance your experience is to go with your makeup and hair done. It doesn’t have to be professionally done, but it’ll help you imagine what you’ll look like on the big day. And remember to have fun! Enjoy these special moments – good luck! The rustic wedding theme isn’t anything new, but it has staying power for a reason; it’s chic, it’s timeless, and it’s oh-so-romantic. There are so many things that are classic ideas for a rustic wedding like mason jars, barrels, hay seating. Have some fun creating a rustic bar or show off some cowboy boots with your Bridesmaids. Finally tree stumps and rustic signs are also very popular. You’re a very lucky mom if your daughter asks you to give a Mother of the Bride speech. This opportunity is a once-in-a-lifetime one, so be sure you make it as perfect as possible. Follow these steps to make the best Mother of the Bride speech ever. We have hints and tips to lead you every step of the way so you don’t miss anything vital. Your daughter will have tears in her eyes by the time you’re through, and will know that her decision to include you in the toasts was a good one. Ultimately, this speech is meant to encapsulate the love you have for your daughter, so as long as you make your Mother of the Bride speech full of love and well-wishes, you’ve done your job. 1. Thank your daughter for letting you speak. Not everyone loves sitting through a host of speeches, so a lot of brides and grooms try to keep it to the maid of honor and the best man. Clearly, your daughter wants you to be one of the special people to toast at your wedding, which says something about your relationship with each other. 2. Thank the audience for coming. Even if you took care of the financials of the wedding, or even the planning, and you feel they should be thanking you, don’t be worried. You will be thanked. However, the reception wouldn’t happen without the couple’s closest friends and family showing up, so be sure to thank them in your Mother of the Bride speech for spending this special day with the happy couple and make them feel welcome. 3. Tell your daughter you love her. You do this every day, seven days a week already, but today is the day she wants to hear it the most. After all, this Mother of the Bride speech is about how much you love your girl, in the end. She is your ray of sunshine, and the audience couldn’t possibly fully understand your love for her, but she will understand, and she will appreciate you reaffirming this. 4. Don’t embarrass the bride. You probably thought the days of “Mom, you’re embarrassing me!” were over when she graduated high school, but this rule applies during the Mother of the Bride speech. Anything you say of your daughter, especially when she was younger, is bound to be slightly blush-worthy, so just ask the bride if you can mention a certain story if you’re not sure. It’s always better to be safe than sorry. 5. Wish your daughter well. There are a variety of ways to do this in the Mother of the Bride speech. If you’re religious, you can do this in the form of a short prayer, or if you’re literary, you can write her a poem. Find whichever way captures your relationship best to send your daughter off to her new, happy life with with the same warmth and tenderness with which you helped her lead her old one. 6. Welcome the groom to the family. Like it or not, this man is officially a part of your family. And, let’s be honest, if your darling daughter chose him, you probably do like him. In your Mother of the Bride speech, give him a warm welcome – and remind him how lucky he is to have a bride like your daughter. Don’t ever let him forget. 7. Give a toast. Toast the audience, toast the celebration, but most importantly, toast the happy couple. A marriage blossomed today, and that deserves a blessing. There is no one better to give it than the woman who helped make the bride the best she could be and stood with her for her entire life. As your daughter’s big day gets closer, you’ll want to make sure you know the Mother of the Bride duties. The maid of honor handles a lot of the planning to help out the bride, but moms can have their fair share of tasks as well. 1. Be supportive and encouraging when helping your daughter find a Wedding Dress. While some brides are overjoyed by shopping for hours on end for the perfect dress, you know your daughter best, and it can turn into a stressful search. 2. Research family traditions that have been incorporated into relatives’ wedding ceremonies. You can also find old family heirlooms that can be passed down to your daughter on her most special day. 3. Be a backup contact for caterers, florists, and other services. If the bride has a rehearsal or appointment and cannot take a call or another appointment, be there for her when you can. Just make sure you’ve communicated with her on what she wants. You don’t want to make a decision about, say, flower colors that she hasn’t approved. Every bride at one point or another will come into conflict with their mother during wedding planning (trust us). Even if she is your best friend, your pseudo-wedding planner, or your right-hand woman for every decision, you will clash at some point. Even the mothers that prefer to stay in the background will have opinions. So what do mothers of the bride need to know? We rounded up 10 of the best tips from brides about what every mother should remember during the planning process through the wedding day. Hint: pass this along (nicely!) to your dear old mother. 2. It is inappropriate to wear white, cream, or ivory. Mothers of the bride, do not even think about wearing a color in/near/around the whites on your daughter’s special day. It is totally inappropriate and unkind. She is the princess in white and no one should be close to her wedding gown color on the day. Need some guidance? Shop MoB dresses here. 5. Get to know the in-laws. This is your daughter’s new family and in this day and age, the mother of the groom may be just as involved as the bride’s mother (or would like to be) when it comes to planning the big day. Especially when budgets are getting split. Brides, make sure both mothers feel included! How about a lunch date for the ladies to discuss the wedding details? 6. Be supportive, no matter what. Even if your daughter is turning into bridezilla (which they sometimes do), mothers need to stay poised, calm, and collected. It is your job to be the pillar of stability during this crazy time and your daughterswill want someone who can both help them make the big decisions and keep their cool when things go awry. We can’t promise it will be easy, but please try for the bride! There’s no other tradition as synonymous with marriage as the white wedding gown. And for some brides the process started years ago. Are you the bride who started looking for your Wedding Dress before you were even engaged? You’re not alone. Most brides have thought about walking down the aisle in their Wedding Dress for years, probably envisioning the entire process of trying on dozens of dresses and falling in love with “the one”. DO Learn the Wedding Dress shopping lingo: Know your “Gown Vocabulary” before you go to your appointment, so that you are sure you and the consultant are on the same page. Click here for Team Wedding’s ultimate list of Wedding Dress shopping lingo. DON’T Wear The Wrong Underwear: This is one most brides don’t even think about until it is embarrassingly too late. Simple rule is to make sure you wear nice underwear. The bridal consultant and likely your friends are going to see you in them, so make the effort. Read more. DO Remember Your Budget, Always: This is a no brainer. Don’t try on dresses you can’t afford. The simple law of attraction says you’re going to fall in love with the dress you can’t have and then you’re only setting yourself up for failure. Don’t do it. Read more.